Jonathan Schoop smacked his first Carolina League home run as part of a perfect 4-for-4 night, leading the Keys to a 4-3 victory over the Red Sox on Tuesday evening at Harry Grove Stadium. Salem led 2-0 after five-and-a-half, but Frederick rallied for two in the sixth and an additional pair in the seventh to earn the victory. In the sixth, Schoop blasted a shot to left-center for his ninth round-tripper of the season, but just his first in 39 games as a member of the Keys. Manny Machado followed with a double and Anthony Ranaudo walked Kipp Schutz to abruptly end his outing. Chris Martin entered and allowed one of the inherited runners to score on a sacrifice fly by Dale Mollenhauer, tying the game at 2-2. An inning later, Schoop was in the middle of things again, roping a two-out RBI single up the middle off Martin to drive in Brian Ward to give the Keys a 3-2 lead. Machado then smashed an RBI triple to deep center to double Frederick’s advantage. The two runs ended Martin’s consecutive scoreless innings streak at 29 and one-third frames between Greenville and Salem, dating back to June 15. Salem had multiple opportunities throughout the game, but fell by a solo run for the 16th time this season. The Sox had the bases loaded and nobody out in the first, but only one run crossed the plate, with Derrik Gibson scoring on a double play by Bryce Brentz. 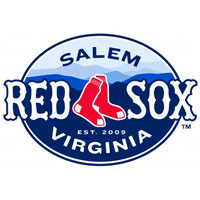 Salem had runners on first and second with nobody out in the third and again with two outs in the fifth, but Jorge Padron grounded out on both occasions, as Salem went 0-for-7 with runners in scoring position. Brentz and Dan Butler each blasted solo homers for Salem, with Brentz’ being his 22nd of the season, 11th in a Salem uniform. Butler’s eighth-inning bomb cleared the secondary wall in left field for his 10th jack of the year, but just his first since June 15th. Sean Gleason retired the Sox in order in the ninth to send Salem to its 10th defeat in its last 13 outings. On the flip side, Frederick won for the 12th time in its last 13 games to improve to an astonishing 62-38. Kolbrin Vitek was the lone Red Sox player to notch multiple hits, going 2-for-3 to extend his hitting streak to seven games. Ranaudo was phenomenal through four, needing just 40 pitches to face one over the minimum. However, the Keys loaded the bases without damage in the fifth and then knocked Ranaudo out of the ballgame three batters into the sixth. Ranaudo struck out three and walked two, while giving up two runs on six hits in five-plus innings. Martin’s roughest outing of the season gave him the loss, as he yielded two runs on three hits in three frames on the bump. Even with the two tallies against him, his ERA sits at 0.84 in the Carolina League. The Sox and Keys meet again on Wednesday night, as Chris Hernandez will battle Ryohei Tanaka. First pitch is scheduled for 7:00 PM.